Created with the #FeministHackerBarbie generator! 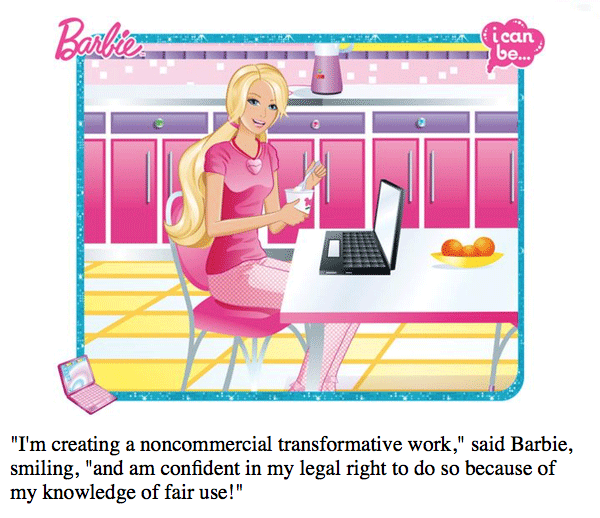 If Barbie can learn about computer engineering, she can learn about copyright too, right? When I sat down with my laptop last week and started editing Barbie images in Photoshop, not in my wildest dreams would I have thought that what I was creating would end up shared more than 10,000 times and that I’d be talking to NPR about it. It is so amazing how many people care about representation of women in computing, and I’m thrilled and humbled that something I created helped to expand this conversation. I wrote a piece for Slate about the process and the ideas behind Barbie, Remixed, but something I wanted to discuss in more detail was the act of remix itself rather than the critique behind it. As I noted in my original post, one of my first thoughts about the outcry over the original Barbie book was that it would very likely spawn some kind of remix – and that it would be a really fantastic example of fair use. If you don’t like the narrative, change it. Warning: This might well be TL;DR for many of you, but I wanted to take this opportunity to talk at length about the nuts and bolts of fair use, since this is a topic that is very important to me. I did go to law school (and my specialty is intellectual property law) if that gives some credibility to what I’m writing, though don’t consider this actual legal advice. I’m going to link mostly to Wikipedia articles in the explanation below for those who want more info because they’re pretty good, and I assume that anyone more interested in reading law review articles or court cases knows just how to find them! There are a few links for further reading at the bottom of this post. In U.S. law, fair use is the legal doctrine that allows for some uses of copyrighted work. Copyright law provides certain exclusive rights to copyright holders (“all rights reserved!”), which includes the right to create derivative works. However, it also provides exceptions to that exclusivity, and fair use is one of those exceptions. Imagine if there were no fair use exception to copyright law. You wouldn’t be able to quote books in book reviews and Saturday Night Live couldn’t parody television shows. Also, we wouldn’t have VCRs (or other time-shifting technology that followed them). Fair use (17 U.S. Code § 107) is noted to especially apply to “criticism, comment, news reporting, teaching, scholarship, or research” (though this is definitely not an exhaustive list). Imagine if you always had to ask permission to use part of something in order to criticize it – I imagine that permission would rarely be given. Therefore, fair use is considered to be something of a “safety valve” between copyright protection and free speech. One famous example might be the novel The Wind Done Gone by Alice Randall, which was a re-telling of the novel from the point of view of the slaves. It was in part a critique of racism in the original book, and it was judged fair use after Margaret Mitchell’s estate sued. (Though note that a work does not have to critique or comment on the original in order to be fair use, as established in a recent case about transformed photographs). 1. The purpose and character of the use, including whether such use is of a commercial nature or is for nonprofit educational purposes. A famous Supreme Court case about the 2 Live Crew parody of “Pretty Woman” established some time ago that one of the most important aspects of this factor is how “transformative” a new work is – not just how much of the original is present, but how different it is in aesthetic or purpose. (And “transformative purpose” is also why Google Image Search can still show us thumbnails.) Parodies are generally considered to be highly transformative, as are uses for the purpose of criticism of the original. Also important to this factor (though not win-or-lose) is that something is more likely to be fair use if it’s non-commercial. For the record: I’m not making any money off of Barbie, Remixed at all. 2. The nature of the copyrighted work. This refers to whether the original work is published or unpublished, and fiction or non-fiction. Use of an unpublished or non-fiction work would weigh in favor of fair use. Barbie, Remixed does not fall into these categories, but because most cases that come up deal with published works, this factor tends to not carry a lot of weight. As the Supreme Court points out in the parody case above, this factor is unlikely to be any help for parody, since parodies pretty much have to copy publicly known, expressive works. 3. The amount and substantiality of the portion used in relation to the copyrighted work as a whole. For Barbie, Remixed, I used most of the artwork and very little of the text from the original. A guideline that has been stated in previous cases is to use just as much as necessary for the new use. You might notice that the text on Barbie, Remixed is fairly small on some pages; I used the original images at only the resolution required to read my new text. This is the same rule of thumb that Wikipedia uses for fair use of images such as book covers or movie posters that illustrate their articles. As for why I used the images at all as opposed to creating new ones – it was necessary in order to comment on the original. What made the remix so effective is that you could see the new panels and immediately compare them to the old ones. 4. The effect of the use upon the potential market for or value of the copyrighted work. This is known as the “market harm” factor, and generally asks whether the new work would act as a direct market substitute for the original. For example, would someone read a fan fiction story about Harry Potter instead of buying the original books? Probably not. Would someone read Barbie, Remixed instead of reading the original? Hmmm. This actually became a more interesting question than I original anticipated, because so many people told me that they would rather have mine than the original. However, I would argue that the people who like my story are the same ones who are outraged by the original – i.e., no one who would ever buy it. (This harkens back a bit to the Wind Done Gone case where the ruling turned in part on the fact that the Mitchell estate never would have licensed the book officially because they wouldn’t have approved of the content.) To the extent that Barbie, Remixed might discourage anyone from buying the original, that is also irrelevant. As the Supreme Court put it in the 2 Live Crew case, “the fact that a parody may impair the market for derivative uses by the very effectiveness of its critical commentary” has no impact on a fair use analysis. Though this of course has become a moot point since Mattel no longer offers the original for sale. I also added the Barbie, Remixed logo to the bottom of every page to help ensure that there’s no market confusion (though honestly, I think that based on the response, Mattel might not suffer for it!). Is it possible that someone else would be able to make different arguments than I have here and come to the conclusion that my work might not be fair use? Sure, though based on past precedent, it would be a pretty difficult argument to make. Also, my reasoning above would be similar for Feminist Hacker Barbie, which has the same transformative purpose as my work. The fair use notice that I have at the bottom of the remix is neither a license nor a disclaimer. It’s not necessary at all from a legal standpoint, and I put it there as an explanatory gesture and to emphasize that fair use exists. Attribution is not necessary for fair use, and in fact is not part of the copyright analysis in any specific way. Attribution is good ethical practice, but failure to attribute is not copyright infringement. However, it does show good faith, which is why I linked to where the original was sold on my website. The source of Barbie, Remixed is also clear since the title is unchanged. The Creative Commons license I put on Barbie, Remixed applies to my new content (which is why the license includes a note about the original source). This has no relationship to fair use of the original material. It just means that you can use my remix if you like – such as translating it into new language, printing it out and distributing it, or even remixing it into something new. It would be your responsibility to determine if your new work was fair use of the original content–though, unless you put more content back into it, it most likely would be. The license I used was CC-BY-NC, which means that if you use it, you’re required to attribute it back to me and that you can’t use it commercially. i.e., don’t print my remix out and sell it! Barbie, Remixed is non-commercial, but remember that this is not the magic word for fair use. Not all non-commercial uses are fair use, and not all commercial uses aren’t. However, non-commercial uses are much more likely to be fair use. Did you read this far? Thanks! I want to mention one more thing, which is that I volunteer for a non-profit called the Organization for Transformative Works. The OTW’s mission is to protect and support noncommercial fanworks as legal, transformative works. (Although to be clear, the OTW had no role in creating Barbie, Remixed – that was just me!) If I actually ran into any trouble for a transformative work like Barbie, Remixed, I would rely on organizations like OTW and EFF for help, and that is what I would recommend if you have questions about the status of a noncommercial transformative work. Unfortunately, because fair use can be confusing, it can also be scary. My dissertation focuses on how copyright law affects creativity and technology use in online communities, and something I’ve found is that it can have chilling effects – i.e., people deciding not to share or not to create because they’re afraid of getting into trouble. I have seen a few comments stating incorrectly that Barbie, Remixed is definitely copyright infringement. I happen to be confident enough in my knowledge of the law to know that this isn’t true – but for many people who didn’t spend three years in law school, being told that someone might sue them is enough to scare them into taking a work down from the Internet. I often use the example of Jonathan McIntosh fighting the DMCA takedown of the Buffy vs Edward remix video to point out that most people in that situation would simply have let the work (unfairly!) disappear. Copyright serves a hugely important role in our society in protecting and incentivizing creativity – and fair use is the safety valve that prevents it from inadvertently stifling it as well. I hope that this was informative! Though I won’t give legal advice on this forum (and nothing in the above should be construed as such! ), I’m happy to answer questions or to find answers if I don’t know them. I understand this may extend beyond your area of expertise, but would you care to speculate as to whether redistribution of Barbie™ Remixed would run into legal problems outside the US? That is an interesting question. Fair use applies if the work is created in the U.S., and typically there is no impediment to distributing beyond the U.S. I admit I haven’t thought specifically about the issue of REdistribution (I assume by someone outside the U.S.?) but it seems unlikely that the burden would be on the new person to verify the status of every piece of content used in the original. I can’t think of any examples of when this has been an issue, though I admit my expertise is a bit limited once outside U.S. law. There is a good chapter in the Aufderheide and Jaszi book “Reclaiming Fair Use” on fair use in an international environment. Hi, I just wanted to say that I really love your blog and this is a book my class recently reviewed and I can honestly say it was inspiring and truly amazing. Don’t stop what you’re doing because you’re working it.